Provides air circulation to reduce dead spots in the greenhouse, reducing high moisture areas that promote mold growth. By installing multiple heaters within the greenhouse you build in redundancy. If one unit would happen to go down, you still have others to maintain freeze protection which could save the entire crop. 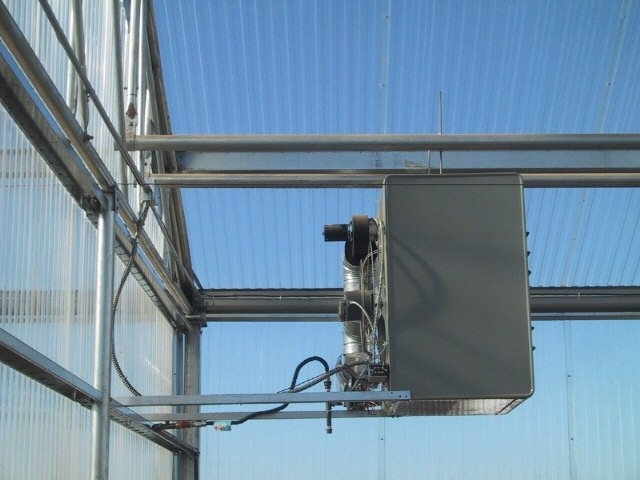 Versatility allows air to blow from the top of the greenhouse or through ducts. Fan only operation may be used to circulate air in the warmer growing periods. Heaters are indirect fired, allowing all combustion products to be vented to the exterior of the greenhouse. Some plants are particularly sensitive to toxins found in the products of combustion. By using a fan to move the air, the heaters provide even heat throughout the entire greenhouse. Modine gas-fired unit heaters maintain a minimum 80% efficiency. The Modine PTS/BTS line vents outside the greenhouse, where it also gets its combustion air, allowing you to keep your greenhouse tight and keep those wasted energy dollars for yourself. Keep corrosive chemicals outside of the combustion chamber; the new PTS/BTS separated combustion product line draws clean combustion air from outside the greenhouse. When combined with an optional stainless steel heat exchanger, you can add years on to your investment.